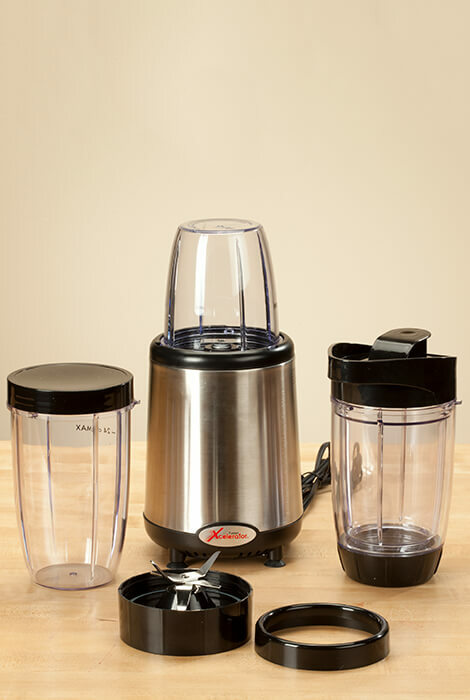 Outperforming ordinary blenders, the Fusion Xcelerator food emulsifier's high-intensity turbine action breaks food down into tiny micro-cellular pieces—helping maintain more key nutrients so you enjoy the purest, healthiest smoothies, sauces, salad dressings and more. Its powerful 1000-watt motor liquefies whole fruits and vegetables, breaking them down into a pre-digestive state while capturing all of the essential vitamins, minerals, anti-oxidants, and phyto-nutrients. Making food prep quick and easy, this versatile personal blender also pulverizes nuts, grains and more. It includes a recipe book and meal plans designed to promote healthy food choices—which may promote weight loss, increased energy and a stronger immune system. The hand blender uses a quad blade for blending juices and smoothies and a dual blade for milling grains, grinding herbs and chopping nuts (both interchangeable blades are made of surgical-quality stainless steel). Simply place the cup onto the power base, twist to lock and activate the motor. Set includes: blending base, 24-oz. cup, 18-oz. travel cup with flip lid, 12-oz. cup, dual blade, quad blade, drinking ring, storage lid, 24-page recipe book, Meal Plan with over 100 recipes, Fitness Guide, 142-minute Bonus Workout DVD, 10-day Jump-Start-Your-Results Guide. Stainless steel. Does just what it says will do. Even liquefies cold precooked meats. Nice blender for the price.. I bought this item for my daughter...her older one broke after Christmas...I replaced it with this model...she loves it. 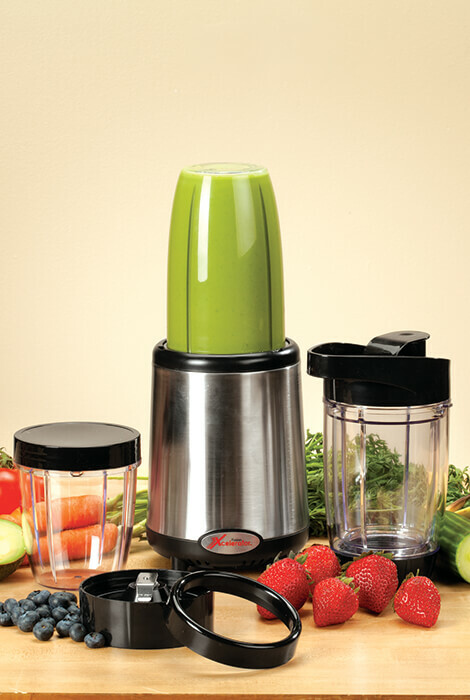 great for making power up beverages, like smoothies etc.